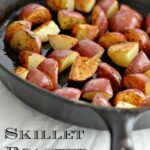 I don’t think I’ve come across a potato recipe that I haven’t fallen in love with. Let’s face it, it’s very hard to destroy a potato. 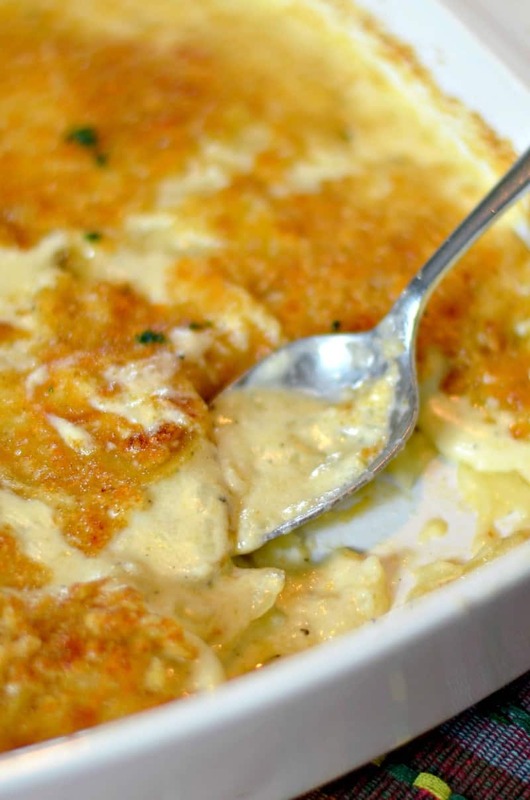 But the addition of a warm cheesy sauce and then baking until it’s bubbly and hot is just magical! That my friends is the definition of Potatoes Au Gratin. cheese, which browns at the final stage of cooking. 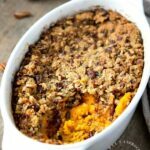 I was introduced to the addition of bread crumbs on top of my potatoes quite some time ago. I like the crunch that it adds, but I do find too much is too much. It takes away from the dish rather than enhances it so I try to use it sparingly while letting it crisp up under the broiler to get bubbly. 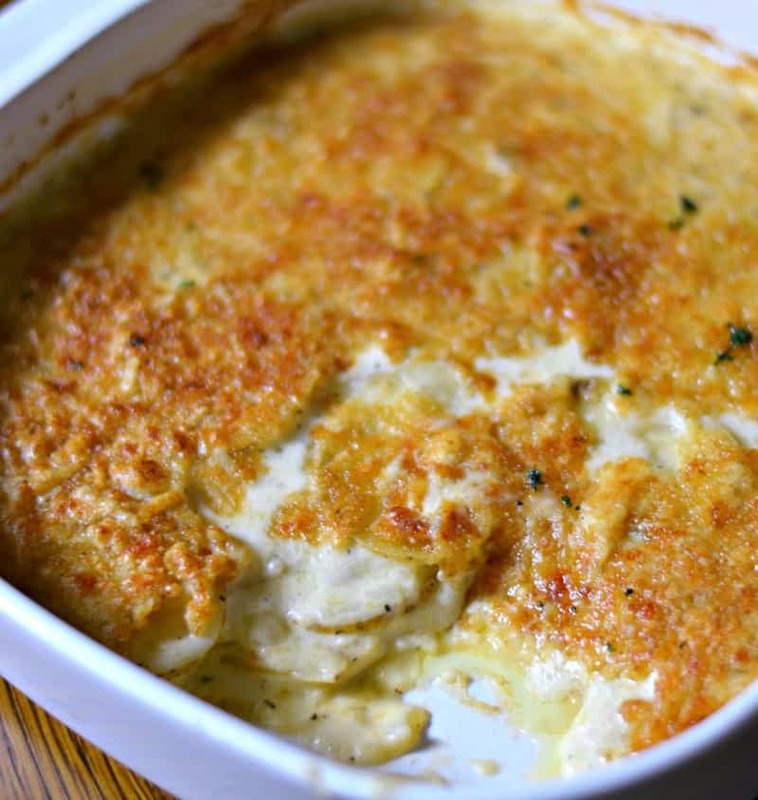 Potatoes Au Gratin is a fairly simple dish to make, however it does take time to cook, anywhere from 45 min to 1 hour. 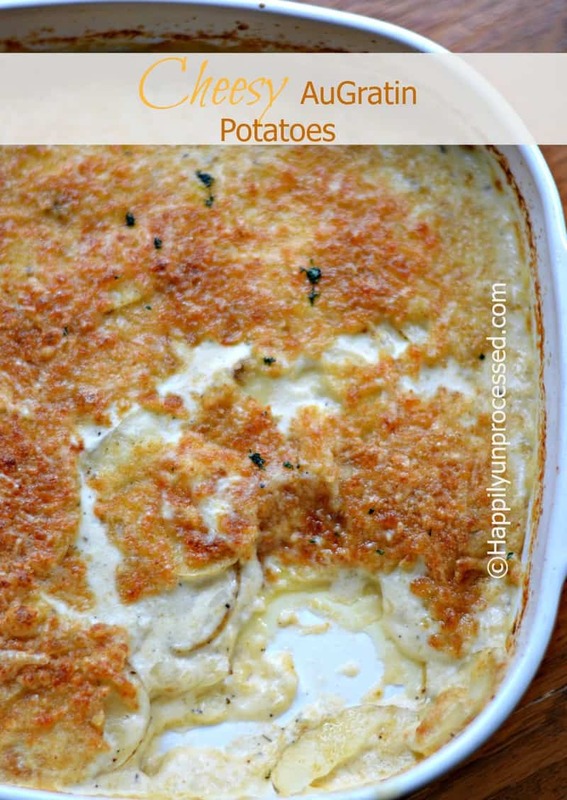 So I’m sorry to say this may not be a weeknight side dish for some of you. However, there are weekends where you will be happy to serve this piping hot bubbly cheesy goodness! 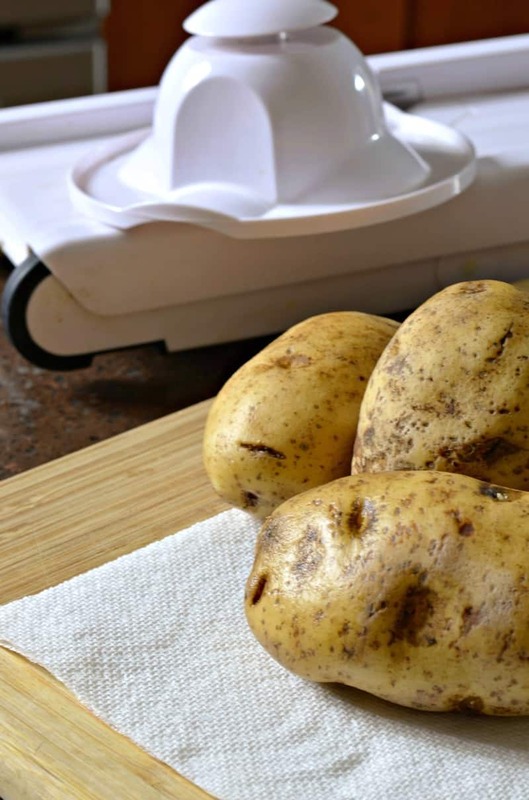 Just be sure to really scrub them to get them clean and organic is your best bet here due to the pesticides and chemicals you will find on conventional potatoes…… or can peel them if you wish. 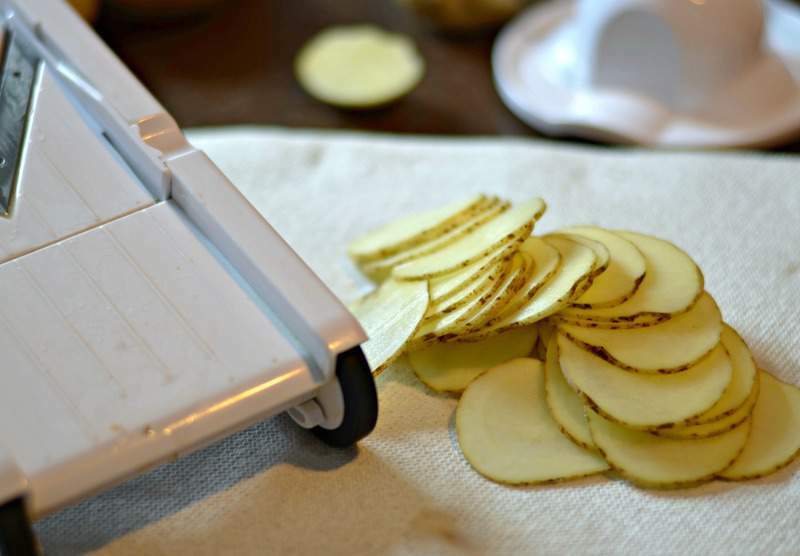 I’m using a mandolin here to get my potatoes as thin as I can. They are relatively inexpensive and ensure an even and concise slice each time. Just watch your fingers (experience talking). I want to take a minute to talk about the sauce. You want to make sure it does NOT come to a boil. Boiling cream makes it curdle. 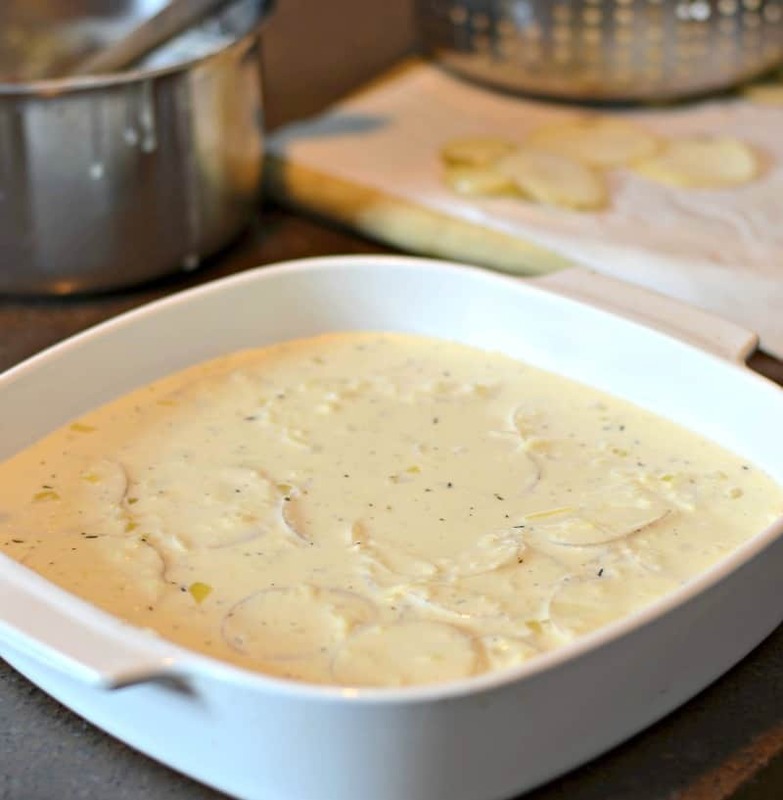 You want to keep the sauce WARM on the stove while you are slicing your potatoes and preparing the baking dish. Then when you are ready, take the saucepan OFF the heat to incorporate the cheese. Again, cheese is another component that is easy to break when it gets incorporated too quickly. 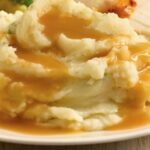 Pour your sauce over the potatoes one layer at time so each potato gets a little moist. Continue to layer until you are done. I got 4 layers and I used a 9 x 9 baking dish. If you were to use a 9 x 13 you will most likely get 3 layers. Cover it tightly with foil and bake it on the middle rack in a preheated oven at 350 checking it at 45 min by poking the potato with a fork. Then remove the foil and sprinkle the breadcrumb/cheese mixture over it and place it under the broiler to get nice and bubbly. 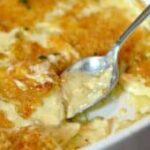 These tantalizing scalloped potatoes are a deliciously warm and cheesy side dish to accompany ham, chicken, pork or steak. All nutritional information is approximate and based on the number of servings listed.